Quick Links : NEWS ARCHIVE | INSIDE THE FREEMASONS | SEASCALE TO BAKEWELL VIA WHITBY - PEDALLING FOR DERBYSHIRE! Derby Masonic Hall was packed to capacity with nearly 300 Masons taking their seats. Unusually the Provincial Grand Master was seated on the floor area as he was still suffering from the after effects of an operation on his foot. The Provincial Grand Master announced the launch of the 2025 MCF Derbyshire Festival. The target figure is £1.5m. It is hoped that this figure can be achieved whilst the Province continues to support smaller worthy charities in the community. It was amazing to discover that the fund had already reached 10% of its target with £150,000 already donated! The new Festival Tie was on sale and worn for the first time. They are now available for only £10 from the Grange bar or from W Bro Martyn Bertalan of Mentor Lodge Tel : 07960 434061 or Email : mjbertalan@hotmail.co.uk and over 200 were sold on the day. They will soon be issued to all of our Masonic centres so members will be able to buy them when they next attend. It is the wish of the Provincial Grand Master that members buy a tie and wear it whenever possible. We all thought the Tercentenary year was hectic but this last one has seemed as busy if not more so. It feels as though we haven't stopped celebrating and the coming year shows no sign of a let up. Thus a quick resume of a year which saw the Centenary celebrations of Mellor and Cestrefeld Lodges together with the Sesquicentenary of Phoenix Lodge of St Ann. We also had our second amalgamation when Dale Abbey and Erewash Lodges became Dale Abbey in Erewash Lodge. Tremendous occasions and both of our merged lodges appear to have benefitted hugely from the amalgamation process. Our second Community Awards Night, in the presence of the Lord Lieutenant and the High Sherriff, proved to be both uplifting and emotional. The Travelling Tercentenary Gavel has, in its first year, been held by nine lodges - Rutland being the current Holder - and has seen raiding parties averaging some twenty brethren descending on the host Lodge. Good for the host lodge and good for the Province. The Derby Civic Society Blue Plaque - our Blue Plaque - was formerly unveiled in June and is attracting considerable interest. 2018 also saw two other important centenaries namely the signing of the Armistice together with the formation of the RAF and the 75th anniversary of the Dam Busters raid in which Derbyshire played some small part. We had settled on two showcase commemorative events. Last year I mentioned our lost War Memorial - well just look in the garden! A stunning tribute to the fallen and it was unveiled and dedicated on November 2nd in the presence of the Lord Lieutenant, the Mayor of Derby and other invited guests including serving members of the armed forces, contingents from the Air Training Squadrons and Naval Cadets together with our own Royal Marine Bugler WBro Adrian Harper. Over 100 Masons in regalia, led by the Provincial DC paraded down to the Memorial and it was a very emotional occasion. A 1918 High Tea followed, after which most of us attended the USLofD Remembrance meeting. At the FB, at nine o'clock, the names and details of those who had fallen were read out by the WMs or members of their respective lodges. A very poignant moment. But who can deny that the showpiece event, and something that will remain in my memory forever, must be the Air Training Squadron Gala Night here in a packed Temple in the presence of the Vice Lord Lieutenant, the Deputy Mayor of Derby, other distinguished guests and our guest of honour Squadron Leader George 'Johnny' Johnston, MBE, DFC, the last of the Dam Busters. At 96 what a sprightly man -we had to prise him out of the bar at gone midnight. When I walked in here with him to the Dam Buster theme, I had tears in my eyes. Each of the 15 Squadrons received a cheque for £1,000 plus a framed print of a Lancaster signed personally by Johnny Johnston. This was also part of our programme of engaging with the community and several squadrons have already been adopted by lodges. One cadet asked me how you became a Freemason and at what age could you join. I told him and he looked very crestfallen and then said with a big sigh 'I've got a long time to wait then - I'm only 15'. It was a fabulous event and the many cadets attending were a credit to their uniform, their families and themselves. Both these events required a huge amount of work, research and effort and I cannot praise highly enough all those involved in making dreams become reality particularly WBros John Wood, Philip Bowler, Mike Roe and Dave Merriman -thank you all. So, what of this coming year? We have a number of events pencilled in and initiatives started or about to so here's a flavour. We have seen our numbers fluctuate over the last year, but we are holding up with a 35% increase in Initiations, joining members are increasing and resignations are decreasing - deaths sadly we have no control over. As of March, we were at 2635 - up 11 on last year. This Province is committed to continuing to engage with the community at large and we have all benefitted from that policy. We've now launched the 2025 Festival and we should be using the Festival not only to raise the money for the MCF but also all to cement our growing relationship with the people of Derbyshire. Continue to make local donations, support local events and why not invite them to our Festival events -don't just ask fellow Masons but also your friends and families, the interested, the curious but definitely not interested, the nosey, the charities and organisations that we support - you get the picture I'm sure. In trying to raise our profile within the community we have, for many years, missed a trick. At one Executive meeting WBro Copestake posed the question "What is our biggest asset and most visible presence" -simple our Masonic Halls! They are largely anonymous to the general public. Who hasn't struggled to find Ilkeston or Ripley MH? A small working party has been set up to look at potential corporate signage for all 18 of our meeting places and you will no doubt have noticed the examples of possible signage here today, the result of a lot of hard work and thought by WBros Buntain, Hardy, Oxley Jr and Beet. It is intended that, whilst being corporate, the signage will be tailored to the individual needs of each MH and Buxton, Ilkeston and Chesterfield are among the first to be involved in this initiative. Hopefully by the end of the year every Masonic meeting place will have a corporate sign of some description. Having had a successful Gala Night for the ATCs we are going to do the same for the naval cadets who, bearing in mind we are an island race, get no funding at all from the MOD! WBro John Wood is in the process of compiling a list of all the cadet organisations in Derbyshire and where they meet. This will be circulated to all lodges and it is the hope of the Executive that Lodges will feel able to sponsor one or more unit each year and adopt them, attend any functions and invite them and their commanding officers to our social events. Remember the comment of that young Air Cadet to me! I have just recently signed off the petition for a new Classic Car Lodge, which, subject to the Grand Master's consent, could be consecrated in the autumn and will meet at Ilkeston with its sister Motor Cycle Lodge. In addition, Trisantona Lodge and USLofD will be celebrating their Centenaries and Okeover its Sesquicentenary. We have for the second year been invited to attend the Crich Pilgrimage in July at Crich Stand originally the Memorial to the Sherwood Foresters but now to the amalgamated Mercian Regiment. By then I hope that the Mercian Garden of Remembrance at the Stand will be finished. This is a joint project between the Derbyshire Freemasons and the Mercian Regiment funded by the Provincial Charity. It is being led and orchestrated by WBro Mick Hitchcock, our Charity Steward. He requires some help boys - not financial but physical in doing some of the ground work and laying out. This is an important venture for us so please offer your help if you can and more information will be coming out shortly. "What's a Heritage Officer?" - I saw that question on several lips - it's that big chap over there! Seriously it is an attempt to rectify something that has vexed your Executive for some time and came to a head when a 1949/50 PM's Jewel from my own lodge was recently sold at auction for a derisory £8 - the enamel insert alone is worth £60! We found out about it too late. WBro Prentice has been tasked with recovering our history - PMs Jewels and other Derbyshire artefacts that seem to regularly appear on eBay and in auction houses and shouldn't be. He has already made fruitful contact with several Auctioneers with some considerable degree of success and will liaise with other Provinces to tip them off should anything of theirs appear. He is not just limiting it to Craft and Chapter either. PMs Jewels are strictly speaking the property of the Lodge, are on loan and should be returned when no longer required - we mustn't sell off our history! I have already briefly mentioned our figures and retention will be one of the key drivers this coming year. We estimate that there are some 800 unattached Masons in Derbyshire. How many times have we heard a secretary announce a brother’s resignation because of his or family ill health or financial or work commitments and then those fateful words "but he intends to re join when things are better”? How many do? They invariably drift away, and we lose all contact in 90% of the cases. but they are still Freemasons and entitled to our continuing brotherly love and relief and the support of the MCF if appropriate. WBro Frost and his team of Assistant Almoners were tasked with contacting some 71 unattached Masons. He reported back in a very dejected manner that only 8 were rejoining - 4 to lodges in other provinces because of age or travel but 4 back into Derbyshire. It was pointed out that was over 10% and 8 more Masons then when he started! The programme is now being rolled out Province wide MH by MH starting with the smaller ones. And brethren just think who has resigned from your own Lodge and can we help or attract him back in? He might still be ill and now requiring help from the MCF or he may have died but has a widow who needs urgent help. Think about inviting them back to a Festival event or a special Lodge night. Even if they resigned because Masonry wasn't for them - their view might have changed but we should never be frightened of failure. WBro Frost's team has already intervened in several resignations whereby the resignation has been withdrawn or the brother has felt able to join another lodge. So please we are all Almoners - if you are aware of a possible resignation, contact WBro Frost or the Provincial Office. Often outside help can pay dividends and remember that you don't have to accept the resignation if, on the night of resignation, a proposal is seconded in open lodge and voted on to the contrary. That gives you 21 days grace for the Provincial Almoner to work his magic. 800 unattached - if we could get 10% back, just think of that. Our Porchway Club for new Masons under the Presidency of Gareth Collins is going from strength to strength with over 50 members now and a member of the Club tries to attend every Initiation. 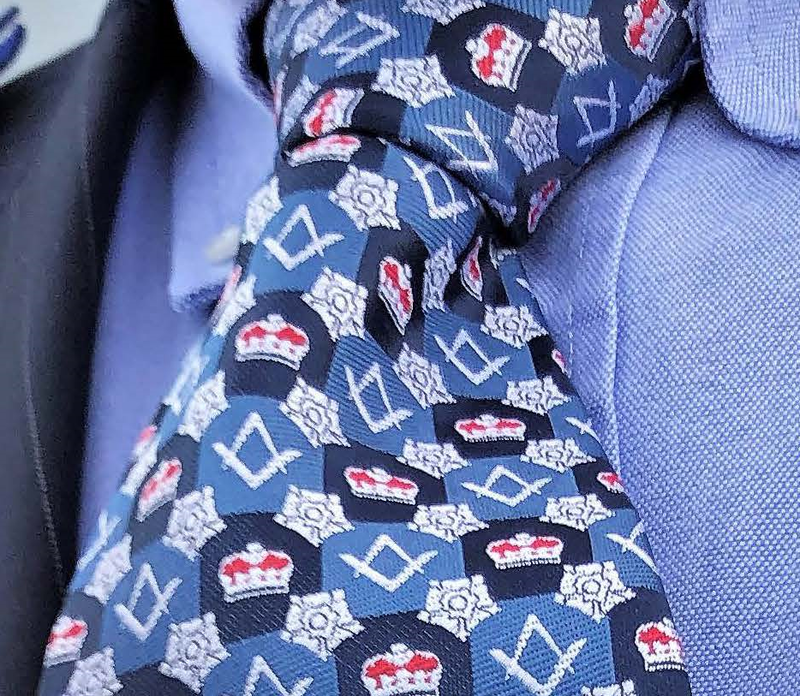 Soon they will have a distinctive new tie which they will wear only at Initiations so that they are easily identifiable. My only reservation is that most of their social events involve alcohol - and they haven't invited me yet!! Brethren there is more but time runs on. You have achieved a lot this year and next year is full of promise as well but all would be for nothing without the dedication and hard work of the Provincial Secretary (in his first year) and his equally efficient Secretariat including the poor Office Manager, Julie Foster, currently nursing a broken ankle. They all deserve our appreciation. Similarly, the Provincial Grand DC and his team who work so hard to make sure that everything is just right for all our formal meetings and visits. I am sure you will all agree with me that they continue to command our respect and admiration. To those stepping down from any office today, I thank you on behalf of the Province for all you have done. To those receiving first appointments and promotions – congratulations – you have earned your appointments or promotions for the work you have already undertaken and the work that you will be expected to do in the Province or in your Lodges. No appointment comes “of right”. As always, I am delighted that the MW Grand Master has honoured several brethren with appointment to or promotion in Grand Rank. I would ask those brethren to stand when their names are read out and remain standing until I have finished when I am sure, brethren, you will wish to show you fulsome appreciation. To be promoted to PJGD WBro Stephen Williams who has been one of those instrumental in reviving Dore Freemasonry. To receive first appointments to PAGDC, WBro Michael Hitchcock our hard-working Charity Steward and Chairman of Fest 2025 and WBro George Frost our very dedicated Almoner. And to be appointed to the acting rank of AGDC our Provincial DC WBro Ravi Sahnan. Hearty congratulations to you all. It's been a tremendous year and I have had the benefit of an enthusiastic and dedicated Provincial team. I know that the incoming team can't wait to get cracking and do even better. We are going to have a lot of fun and enjoy this coming year but above all we should be proud to be Derbyshire Masons. I'm proud to be a Derbyshire Mason and I am so very proud of you.